Garima Parakh is a fine artist from the Boston area who creates landscapes, still life and floral paintings that have a certain joyful emotion in them. She draws her sense of color from many places including her native country India and USA, her home since 1999. In 2011, she left a successful career in the IT industry to pursue her passion for art. Oil is her medium of choice. The artist paints full time in her home studio in Andover. Creating art that has great color, depth and mood are my key objectives. I use a combination approach from wet-on-wet, to layered, to scraping using both brush and palette knife. In my recent work, I am attempting to use shapes of color, transparency, and layers to create an interesting surface and design. All the paintings both large and small (in the glass display case) depict scenes from my neighborhood, Windemere Drive in Andover. I hope the viewer enjoys looking at the different viewpoints and seasons. A price list has been submitted at the library front desk. Please contact me at my cell 339 2272540 or email garima.parakh@gmail.com. 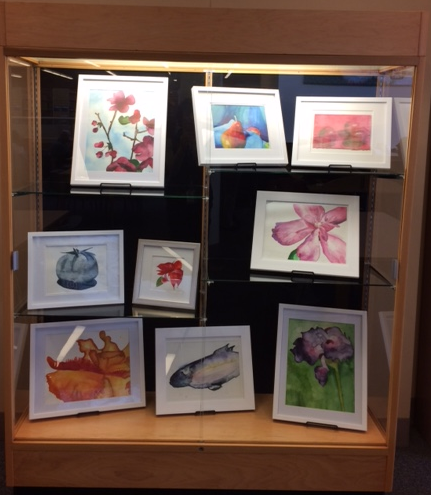 Interested in displaying your artwork at the library? We'd love to hear from you! Virginia Guazzaloca is a Library Assistant at Memorial Hall Library. She is a photographer based in New England who has been taking photos since she was a young kid. She won an award for her photography at Salem State University, where she graduated with a BA in English and a minor in Photography. One of my favorite classes at Salem State was large format photography. While taking the class, I mainly focused on unique architecture. Any building that stood out in any way became my subject, whether it was because it had burned down, or was covered in buoys, or just an old stone church in the middle of nowhere. I went on a trip to Monhegan Island, a small island off the coast of Maine, and spent my entire trip taking pictures. I wanted to get across the idea of just how small the community is there, and just how beautiful it is. Please contact Virginia at vguazzaloca@gmail.com for a price quote if you are interested in her work! This month's hanging exhibit and display case feature works by artists at Island Street Studios. Island Street Studios at Union Crossing is a vibrant and diverse creative community of artists, artisans and entrepreneurs located in the heart of Lawrence's historic downtown. Housed within one of the eco-conscious, redeveloped mill buildings, ISS is on the second floor with views overlooking the former Everett Mills on one side and the mighty Merrimack River on the other. The artists on display include Leslie Cottrell, Cassie Doyon, Emily O'Hara, Elizabeth Peck and Tiffany Stewart. Cassie Doyon is a local Merrimack Valley artist and art teacher who works with mixed media mosaic sculpture. Her art reflects a life long interest in primitive/tribal arts around the world along with the beauty of the natural world and is particularly focused in surface design, color and pushing the boundaries of sculpture with unconventional and repurposed materials. Emily O’Hara of Silver Labyrinth Design is a self-taught metalsmith and fiber artist. She maintains a metals studio at Island Street Studios in Lawrence, MA and a weaving studio in her home in Andover, MA. In 1990, she took her first weaving class at East Lansing Community Education in East Lansing, MI. After returning east, she took classes in color theory and design and tapestry weaving at Harrisville Design in Harrisville, NH. She was a member of Hudson-Mohawk Weavers Guild in upstate NY and The Weavers Guild of Boston in MA. Upon reading a brief article about weaving with metal in Handwovenmagazine, she became increasingly curious about metal weaving and found her first course in metalsmithing at Cambridge Center for Adult Education where she has taken classes for the past fifteen years. Additionally, she has taken courses at Metalwerx in Waltham, MA and MassArt in Boston, MA. I believe that art is essential to our quality of life. Painting is my escape to an amazing place. It enriches me, soothes my soul, balances me, and gives me peace. I am passionate about painting, and hope my audience feels my excitement. I grew up on a farm in Poland, where life was both hard and simple. My art education began in the US, with classes and workshops taught by local New England artists. Eventually, I earned my Certificate in Fine Art from the New Hampshire Institute of Art. Then continued with several semesters at the School of the Museum of Fine Art, Boston. Today, I continue my educational journey by taking a little bit of something from many, different, well known artists, including David Leffel, Jeffrey Watts, Rose Frantzen, Robert Liberace, and Michelle Dunaway. My painting experience centers mostly in New England. However, I also travel extensively to paint in the American Southwest, Alaska, France, Netherlands, Norway, Italy and Scotland. I paint landscapes (mostly en plein air), trying to capture not only the light and color, but also the mood and energy of the scene. I like to paint portraits (from life), trying to convey the character, personality and spirit of the subject. With my still life paintings I try to evoke emotion in the viewer. My abstracts give me the freedom to express my imagination and the emotions that I feel at the moment. Jean Stewart, accomplished fine artist, goldsmith, jewelry designer and co-owner of Whitney's Custom Jewelry, has been creating one-of-a-kind silver, gold and gem creations both nationally and Internationally. Today, Jean continues this tradition of excellence along with her daughter Whitney Stewart, after whom Whitney's Custom Jewelry was named. Whitney's philosophy is simple - to create one-of-a-kind jewelry creations that are not only intriguing and beautiful in design but also are of the highest quality. Each piece designed by Whitney's features only the best materials such as fine silver, sterling silver, gold, precious and semi-precious stones. When I think of black and white landscape photography, the magnificent images of the West captured by Ansel Adams come to mind. While Andover doesn't have the dramatic features of the West, its woods and ponds are every bit as beautiful in a subtler, more understated way. With these twelve black and white prints, I’ve tried to capture a bit of this quiet beauty that is within a short walk or drive from my home near Andover Center. I enjoy walking in the woods in and around Andover, where my wife and I brought up our two boys and walked our dog. (Many thanks to the Andover Conservation Commission and AVIS for dozens of miles of well-maintained trails.) These walks provide a welcome escape from the hectic rush of the surrounding area. The New England weather and seasons vary these landscapes with an infinite variety of light and mood. I especially love the sharp contrasts of winter, which are well suited to black and white photography. I try to capture this sense of calm and variety of light and mood in my photographs. I also try to find a pleasing arrangement of elements in my compositions without compromising what is essentially random and natural. I use mostly black and white film in medium and large format (2 1/4 inch square and 4 by 5 inch negatives). This allows me to take my time, capture detail and concentrate on variations and balance of shades of gray, contrast and composition. I develop and print the negatives using traditional darkroom processes in my basement and other darkrooms in and around Boston. Instead of sitting in front of a computer manipulating digital images, I enjoy this slower, more deliberate, meditative process, working with my hands to make a physical object. Travel for work and the iPhone revived the interest I had in photography as a child. After a brief fling with digital photography, I fell in love with film and darkroom processes. I began studying photography at evening classes at Northern Essex Community College in Lawrence and Theia Studios in North Andover, starting in 2013. After retiring from a career in software, I continue to take workshops and work as a teaching assistant at the New England School of Photography, struggle in the darkroom, wander the woods in the Andover area and travel under the big skies out West every summer. Jodi Feil at Theia Studios, Nick Johnson at the New England School of Photography, and Bill LaPete at LaPete Labs in Boston have taught me a great deal about photography and printing. I have shown my work at regional and on-line galleries, including the Griffin Museum of Photography, Camera Commons, The Darkroom Gallery, The Curated Fridge, a photo of the day at Don't Take Pictures and an honorable mention on L.A. Photo Curator. To view more of my work, go to richvogelphotography.com. On our first of many walks to the Addison Gallery we collectively heard the sound of the Memorial Bell Tower located at Phillips Academy. The sound of these bells has connected us to our neighborhood and as a community of learners. The children in the Springboard classroom at SHED Children’s Campus refer to it as “Our Clock Tower.” The sound of Our Tower and others in surrounding communities has connected us when we are apart. After the weekend, children often come in with stories about their sightings of clock towers. After a family trip, R came to school eager to share, “I was in Boston and saw a clock tower but it wasn’t like our clock tower.” In the display case, artists used their passion for creating with loose parts to build models of their own personal clock towers. Inspired by the Memorial Bell Tower, children incorporated their version of the many details we have noted on the tower such as writing on the side of the tower, the door, clock with no numbers “just lines”, lots of stairs, base of the tower, crack or lines in the tower, and windows. A big THANK YOU to Christine at the Addison Gallery who has supported and inspired our research of the Memorial Bell Tower. Through looking at work by Paul Manship, we have enhanced the lens at which we look at our three dimensional world. She has guided our endless questions and scaffolded us in gaining a deeper understanding of what we see and the story of what is happening to help us appreciate the art around us. Twenty-four year old self-proclaimed “awesome artist,” Alexander Schwartz, of Andover, is a creative force. Once or twice a week for two to three hours for the past two years, Alex meets with his art teacher, Andrew Royce Fournier, a Rhode Island School of Design Graduate and resident of North Andover. Together, they explore shape, form, color and composition using mixed medias. Each piece created is a slight variation of a theme of line, shape, color and form. Alex’s weekly journey is unplanned and each of his creations is raw and “in the moment.” He just creates. Alex knows that each piece he creates is his design and he is happy with the process. He draws his shapes, forms, numbers and letters in layers and then patiently and painstakingly colors them in. His art is layered, intricate and unexpected. The bright colors and geometric and organic forms create motion and energy for the viewer. The layered colors explode on the canvas surface. Alex’s process and completed works engage the viewers and encourages them to take part in his celebration. Alex’s creative space is a myriad of markers, paints, colored pencils, papers, canvas, cardboard and the sounds of music. Alex listens to all types of music as he creates. Music plays a huge role in his expression. In the words of Wassily Kandinsky, “Music is the ultimate Teacher. Lend your ears to music, open your eyes to painting and …..stop thinking! Just ask yourself whether the work has enabled you to ‘walk about’ into a hitherto unknown world. If the answer is yes, what more do you want?” Alex communicates with this colorful abstract language. He is a masterful and talented colorist, uninfluenced and refreshing. He uses the multi-medias to express his love. As an autistic person, art provides Alex with a great sense of accomplishment, joy and self-love. View more of his work at https://alexanderschwartzart.weebly.com/. My name is Martin Culpepper, I'm fifteen years old and an aspiring wildlife photographer. I'm in 10th grade and planning on going into Biology in college out in the Yellowstone area. I have been obsessed with learning about wildlife since my earliest memory and now it's nice to interact with nature through my photography. I started taking pictures at the age of 12 and have progressively spent more and more time out in nature observing animal behavior and documenting them with my camera. I enjoy taking pictures of bears, owls, raptors, song birds, water birds, moose, deer, weasels, foxes (pretty much all mammals, even skunks) and marine life. I spend about 50-60 hours a month looking for wildlife to photograph, walking in the woods and on the beach. I've been fortunate to travel all over the country with my parents and see animals in all their different environments. My favorite place in the world is Wyoming but I recently went to Alaska this summer to photograph Coastal Brown Bears (basically Grizzly bears that live on the beach) and Alaska comes in a close second for landscape and wildlife. With my pictures and presentations I hope to inspire people to spend more time outside and encourage them to protect nature & wildlife. In my spare time I’m a Boy Scout and enjoy camping, hiking, fishing and all things nature. I also enjoy writing science fiction and have signed up for NaNoWriMo to write a 50,000 word novel in the month of November. All of the photographs in this collection have been taken in the last two years. I’m obsessed with Raptors & Owls so there are many different kinds of owl pictures. I have a 500mm lens and this allows me to stay far away from the bird, respect its space and still get great pictures. All the snowy owl pictures were taken at Salisbury beach, Plum Island and Hampton Beach. I was able to document over 25 different individual snowy owls last winter. The Barred Owl was at Parker River Wildlife Refuge.I spent many many hours with this Barred over the winter last year on the Marsh Loop trail. It was in the area for over four months. The Short Eared Owl is my favorite to photograph because it’s so aerodynamic. I have photographed more Screech Owls than I can count. They’re small and adorable. I have many other photographs of other species of owls as well that are not included in this gallery. The Juvenile Bald Eagle was taken in Salisbury, MA. All the bears, otter and moose were photographed in Alaska on my trip there in July 2018. My mom and I flew in a 6 seater plane an hour and a half down to Katmai National Park to walk with the bears. These are wild bears not captive in a zoo or reserve. This was the most exciting wildlife adventure I’ve ever had. I waited for over 8 hours several days in a row, waiting for the foxes to come out of their den to play. This family was so much fun to watch and take pictures of. The short tailed weasel won first place in the underaged mammal category from the Mass Audubon Society last year. I took this shot at the Ipswich River Audubon Sanctuary in Topsfield, one of my favorite places to spend time locally. This little guy was extremely fast and it’s incredible that I was able to get this picture. I also took the picture of the hummingbird and the fawn there as well. The ducklings I photographed in Newburyport, MA. Living in Andover for 8 years, formerly a member of the Peabody Arts Association. Professionally, an Occupational Therapy Assistant at Ironstone Farm in Andover, The Kioko Center in North Andover, River Valley Charter School in Newburyport, and at various Genesis Healthcare rehab locations. I’m also a certified Reiki II practitioner, and my hobbies right now are essential oils and nutrition. Growing up in Connecticut, I attended UConn, where I had an individualized major in Art and Physiology. I’ve always loved drawing, and took every opportunity to do it at home and in school. I started adding lessons in watercolor and acrylic during elementary and middle school, with an emphasis on detail and realism. My creative world expanded in college, where I explored oil painting, figure drawing, pottery and photography. Mostly, I still prefer two-dimensional mediums, and like to combine structural and natural elements in my compositions.The interplay of color and light always delights and inspires me! I’ve also had a lifelong love and appreciation of nature. In 2017, two of the three photographs here were entered into the Andover Historical Society’s juried show, highlighting 'Andover Places,' and one received an honorable mention. One of the paintings was also accepted for exhibition in Boston to represent the Massachusetts Office on Disability in their Breaking Barriers show. Enjoyment of the arts, nature and physical activity help me maintain a work/life balance, although I don’t have as much time for them as I’d like! Currently my creative efforts are channeled into customized OT treatments and healthy, gluten-free cooking. If interested, a price list is available at the circulation desk, which includes information on purchasing matted 8x10 prints as well. The August and September art exhibit features works by eight members of the Andover Artists Guild: Joan Breen, Melissa Kuhn Forte, Elaine Meisinger, Donna Mills, Steve Mills, Garima Parakh, Donna Price, and Rekha Quazi, MD. Why do I paint? There is so much exquisite beauty surrounding us. Most often, we are too busy to see it. I feel my job as an artist is to look, see, and then reproduce that beauty – not in the way a photographer reproduces an image, but in the spiritual juxtaposition of peace, tranquility and joy; in the gloriousness of color and line; in the spontaneity of that nanosecond of recognition. And then there are the faces: on the subway, in the street, in shops and alleyways. So much beauty, everywhere! The painter sees into the soul of his model. Dropped eyes, a slope of the shoulders, that wisp of a smile fleeting across memories of pain and joy. So many beautiful faces. These are the things that drive me to paint. My mother was also an artist, and she used to say, “The drive is the talent.” So much to paint, so little time! Small Painting 2 - Mount Desert Narrows; Medium: Acrylic on Canvas; Format: Square; Dimensions 10”x10"
I am an Andover based Artist, who enjoys recreating landscapes, animals, and architectural structures through my paintings, sketches, and illustrations. I work with a multitude of mediums including pen and ink, watercolor, acrylic, pastel, and oil. I’m inspired to create scenes that have interesting contrasts within them, humorous elements, or just the simplicity of the beauty in nature. Making my art is a creative journey that helps me become more aware of myself and my surroundings and enhances my sense of the wonder of life. With painting I try to express, without words, the beauty of nature so that others may see it too. If I come across a scene that speaks to me, I do a small sketch or a series of sketches. After selecting one, I will look at the shapes and may move objects around to find a pleasing composition. Then I organize the values so the viewer knows where to look and can easily travel around the painting. I love color and like to note how the light falls on objects. This process helps me to express my feelings about the scene. My painting is a watercolor of the junkyard that formerly was located on Park Street, Andover, owned by Morris Krinsky many years ago. Morris considered himself an artist in that he liked to arrange his findings like sculptural items. My painting is a tribute to Morris and his "Junkque Yard." Unlike many artists, who know from childhood that they are in love with drawing and painting. I began to paint in middle age, and almost by accident. After a 20 year career in corporate pension plan administration, I went back to school to get a degree in fashion design. Wanting to learn to draw and paint so I could execute some fabric designs, I started to take art lessons. The fashion and textile design career never materialised, but those art lessons became the highlight of my week. Fabric fell by the wayside, and now my main love is portraiture. To me, there is nothing more fascinating than the individuality and personality of the human face. I love the challenge of creating a likeness, hopefully capturing not just the surface features, but something of the person’s inner essence as well. I also love to paint “small things”. There is so much beauty around us and painting gives me eyes to see the little miracles of nature - mushrooms, tiny flowers, leaf formations - that I might otherwise miss. Painting - Primary Trinity; Medium: Watercolor; Format: Square; Dimensions: 18.5" x 18.5 "
I work in oil, watercolor, pencil and pastel. My style is realism and surrealism with an emphasis on the human figure. I believe that art is a bridge between the physical and the spiritual. My work as a scientist nurtures my mind as my work as an artist nurtures my soul. Tall trees, quiet marshes and quaint towns .. I am mostly drawn to these elements. I like to go out and paint en-plein air whenever I can. My goal for each work is to achieve the fleeting effect of light on canvas. I paint energetically and quickly. I use a combination of wet-on-wet and layered approach. I often use palette knife to apply paint quicky to achieve the desired freshness and vibrancy. Blending is very minimal. My style is a mix of Realism, Modernism and Impressionism. I am an Andover- based artist. I was born in India and worked in the IT industry for 15 years. I have been painting professionally since 2012. My paintings have been accepted in several juried shows and are held in private collections all over the country. Nature and the environment feature in my artwork as I find inspiration in the natural world around me. I prefer using a bright rich color palette and working in a variety of mediums. I often experiment with composition and enjoy illustration and the ability to tell a story within my work. I have a passion for painting wildlife in a realistic style and I also enjoy sketching, drawing and photography. Born in Australia and interested in art from an early age, I went on to study art after school at the Queensland College of Art majoring in graphic design. I worked as a graphic designer and a commercial artist for many years and also as a children’s art teacher. I have won a number of awards throughout my career and continue to explore the wonderful world of art using a variety of mediums and techniques. Most of my artwork to date has an Australian theme. Now as I live in Massachusetts and as a current member of the Andovers Artists Guild, I am working on paintings of wildlife, landscapes, mixed media compositions and scenes of beautiful New England. I enjoy painting either on site (en-plein air) or in my studio using my own photographic reference. I was inspired to paint this beautiful Owl after discovering her perched in this tree while exploring the woodland behind my home. She was well camouflaged and I was lucky to take a few shaky photos with my phone. I sketched out a rough composition and decided on doing a larger painting that would include the ochre colors and rich browns and greys surrounding her. I have always loved birds, especially owls and as owls are often associated with wisdom and knowledge I thought it an appropriate subject for the library exhibit. Jeanne Marie Blongiewicz, a longtime resident of Andover is an exceptional watercolor painter. She has always enjoyed painting, however worked full time so had little time to commit to her passion. Jeanne Marie was influenced in her early years by her mother Francis Gorse who was an accomplished oil painting artist. Jeanne Marie became an avid student of Andover resident Cory Staid. Cory was a member of the Andover Artist Guild and the Reading Art Association and won numerous awards for her work in the medium of watercolor. Recently Jeanne Marie has been studying with Margo Pullman of West Newbury, which included a trip to France in the heart of Vincent Van Gogh country, where she learned new water color techniques. In 2014, Jeanne Marie suffered a significant stroke that resulted in aphasia, a language and communication disorder. She now has difficulty speaking, so painting has become even more important to her. Since her stroke, painting has helped her relax and focus on recovering. She’s also been able to express herself through her artwork when words are difficult to use. Her favorite subjects are flowers and landscapes of places traveled. Painting helps her appreciate the beauty of nature. Jeanne Marie lives in Andover with her husband, Gary. She has two children and four grandchildren who she spends as much time with as possible. This is her first opportunity to exhibit her artwork. Art puts me in a state of " flow"; it is meditative, much like a musician or an athlete being " in the zone". Flow changes the contents of your consciousness, relinquishes your ego and self for a period of time, and puts you at one with the present moment while not having a thought process outside of the now. Most of my work depicts an in the moment movement, feeling, and connection or the vibrational energy of nature’s presence. Jonathan Hosmer is 32 years old and resides locally in Andover with his wife Adair and 15 month old daughter Isla. He grew up in Andover and attended Merrimack College, where he received his B.A in Spanish, Clinical Psychology, and Environmental Science. Jonathan is passionate about culture, cooking, nature, and art. His art career began with black and white sketches, colored pencils, and oil paints, but he has now grown to love acrylic paints and working with palette knives. The artists featured this month include Leslie Cottrell, bestselling author, transition coach, speaker and founder of The Visionary Passage. Issa Van Dyk's work (monotype prints) explores themes of spirituality from different traditions as well as relationships to our ancestors, other sentient beings, and our place within the overall web of life. Memorial Hall Library has a new Makerspace, Make @ MHL. On display are some of the equipment and samples of what it can do. The Makerspace is equipped with a poster printer, vinyl cutter, 3D printer, sewing machine and all sorts of other cool stuff for creative projects. Stay tuned for program announcements. This month's exhibit features works by a fabric art critique group known as “Joined by Stitch.” The artists include Betsy Abbott of Andover, Tarja Cockell of North Andover, Sue Colozzi of Reading, Janis Doucette of North Reading, Anne Kimball of Lexington, Madalene Axford Murphy of Amesbury, and Alanna Nelson of Melrose. They are all members of SAQA, Studio Art Quilt Associates, a major national organization of quilt artists, as well as several other regional fiber arts groups. They first came together nearly two years ago to support their individual journeys as artists. Every member uses fiber in creating her work but each has also developed a unique voice ranging from the abstract to the representational. While all value color, line, and texture, they achieve those goals through a variety of techniques, some beginning with hand-dyeing, printing or painting, even weaving the fabric, others using the evocative commercial fabrics available today. All use machine stitching in their work but some add hand stitching as a design element. Once a month the members bring work to a meeting, seeking either feedback from the rest of the group for a finished piece or advice on a particular aspect of a work in progress. Their exhibition is available for viewing during regular library hours. The public is also invited to a special evening gathering, “Meet the Artists,” on Tuesday, April 17 from 7:00 to 8:00pm. For information about the work on display visit this page. This month's exhibit features works by Andover resident, Jack McKelliget. He graduated from Andover High School in 2008, and has been drawing and painting for most of his life. He was often commissioned to paint and draw landscapes by family and friends, and this work continues to the present day. Since graduation he has been taking classes at the Essex Art Center, Rockport Art Center and Northern Essex Community College. He enjoys studying history through art and spends a lot of time at the Addison Gallery. You can find more of his work on Flickr. The group show features work by several artists, including Cornia Corneyjo, Cassie Doyon, Deycloud, Lynne B. Mehlman, Emily O'Hara, Elizabeth Peck, Jose Rodriguez, Jean Schwerdt Stewart, Whitney Stewart and Andrea Stoehr. 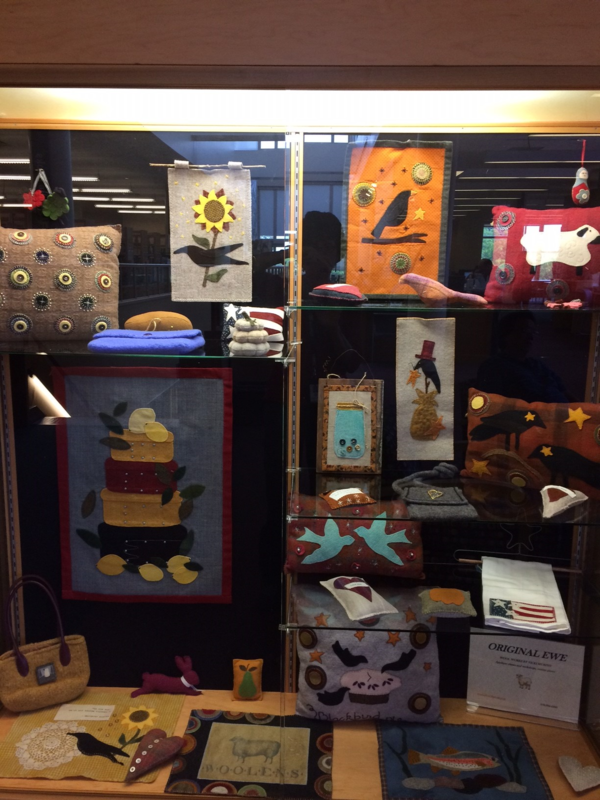 Their work is installed in the Level 1 hanging exhibit area and in the display case in the Reference Room. Corina Cornejo is an artist and fashion designer born and raised in Lawrence, MA. Graduating with a BFA in Fashion Design from MassArt in 2014 she would move to New York City and work as a designer for various brands such as G.H. Bass & Co. and Karl Lagerfeld Paris. After several years in NYC she decided to come back to Lawrence, MA and start her own indie brand known as Bag Lady Goods. Mostly creating one of a kind canvas totes and pouches but also experimenting with hand embroidery. While Bag Lady Goods is still in its very beginning stages she has managed to open up a small studio space in Lawrence, MA and continues to work on building her brand while still working as a freelance designer in the mass market industry. Deycloud is a 25-year-old artist from Lawrence, MA. She studies Graphic Design at Northern Vermont University and loves her community of Lawrence, MA. When she’s not doing her homework, or expressing her anxieties and struggles on canvas, Deycloud spends much of her time mentoring Lawrence youth as an art instructor in addition to serving customers as a barista at El Taller Café in downtown Lawrence. She has been drawing since she was in the third grade and later, started painting in high school. Deycloud’s art is heavily influenced by surrealist Salvador Dalí. Her inspiration flows mainly from her love of psychology and astronomy, ie: how dreams interact with the human mind and its subconscious; the idea of a multiverse, portals, galaxies, alternate dimensions, and magical places. Deycloud believes that her art invites her to dig deeper into her own mind and come to terms with the reality of the world we live in. You can find Dey and her art on Instagram @deycloudart. Drawn to the beauty of nature, Lynne Mehlman has been painting her whole life. Throughout her school years she took as many different kinds of art classes as she could, from ceramics to calligraphy to lithography. However, she never found the intensive and thorough training that she desired until she met Robert Cormier, the instructor of the R.H. Ives Gammell Studios in Boston, MA and a former Gammell student himself. Lynne subsequently studied with him for 4 years. Lynne then furthered her studies with Paul Ingbretson, another Gammell student, in Manchester, NH, for more than 5 years. Lynne’s training comprised as much focus on learning to see as on the craft of drawing and painting. Robert Cormier called it an impressionistic approach, based on what hits the eye first. Paul Ingbretson calls it painting in the visual order. She found truth in Gammell’s words, “A student’s progress seems to him like the falling of successive scales from his eyes… It is, in fact, only after his eyes have acquired a fairly high degree of sensitivity, which is to say, when he can paint fairly well, that a student realizes the overwhelming difficulty of painting.” Her studies began with charcoal cast drawing, as taught in the 19th century European atelier system. From cast drawing Lynne progressed to still life drawing and oil painting, figure drawing, and, finally, portraiture and figure painting. To complement her intensive studio work, she studied plein air landscape painting with David Curtis, yet another Gammell student. Emily O’Hara of Silver Labyrinth Design is a self-taught metalsmith and fiber artist. She maintains a metals studio at Island Street Studios in Lawrence, MA and a weaving studio in her home in Andover, MA. In 1990, she took her first weaving class at East Lansing Community Education in East Lansing, MI. After returning east, she took classes in color theory and design and tapestry weaving at Harrisville Design in Harrisville, NH. She was a member of Hudson-Mohawk Weavers Guild in upstate NY and The Weavers Guild of Boston in MA. Upon reading a brief article about weaving with metal in Handwoven magazine, she became increasingly curious about metal weaving and found her first course in metalsmithing at Cambridge Center for Adult Education where she has taken classes for the past fifteen years. Additionally, she has taken courses at Metalwerx in Waltham, MA and MassArt in Boston, MA. I believe that art is essential to our quality of life. Painting is my escape to an amazing place. It enriches me, soothes my soul, balances me, and gives me peace. I am passionate about painting, and hope my audience feels my excitement. I grew up on a farm in Poland, where life was both hard and simple. My art education began in the US, with classes and workshops taught by local New England artists. Eventually, I earned my Certificate in Fine Art from the New Hampshire Institute of Art. Then continued with several semesters at the School of the Museum of Fine Art, Boston. Today, I continue my educational journey by taking a little bit of something from many, different, well known artists, including David Leffel, Jeffrey Watts, Rose Frantzen, Robert Liberace, and Michelle Dunaway. My painting experience centers mostly in New England. However, I also travel extensively to paint in the American Southwest, Alaska, France, Netherlands, Norway, Italy and Scotland. I paint landscapes (mostly en plein air), trying to capture not only the light and color, but also the mood and energy of the scene. I like to paint portraits (from life), trying to convey the character, personality and spirit of the subject. With my still life paintings I try to evoke emotion in the viewer. My abstracts give me the freedom to express my imagination and the emotions that I feel at the moment. Jean Schwerdt Stewart invested most of her years in creating one-of-a-kind pieces of silver, gold & platinum jewelry,while still studying and working in the fine arts of watercolors and oils. After retiring from 45 years of jewelry design, Jean has been working exclusively in oils, and has invited other artists into her home studio to simply share the joy of painting together. They call their group, "Artists in Action." Jean lived overseas with her husband, and educator with the Department of Defense, and she continued her art studies in many places, including Okinawa, Germany and Yugoslavia. Find her on Facebook. Andrea Stoehr is a self-taught fused glass artist who discovered the beauty of fused glass several years ago during a trip to New Mexico and a visit to a glass gallery. Fascinated by the changes of light and color, she vowed that this was something she just had to do. After taking a one-night workshop on how to make a fused glass tile, she was off and running. Over the following 10 years, and through various experiments, failures and happy accidents, Andrea came to understand the medium more and more. Most pieces are fired in a kiln to 1440-1500 degrees Fahrenheit, with a hold varying per piece being fired. Andrea works out of a studio at the Island Street Art Studios in Lawrence, MA. She has her creations for sale at Positive Images Gallery in Haverhill, MA, and at Pick’n Cousins home décor store in Hampton, NH. She also participates as a vendor in the Coastal Christmas craft fair in Salisbury, MA during the Blue Ocean Festival of Trees every November. Find Andrea Stoehr Designs on Facebook. Leah Arnold is a resident of Andover and a freshman at Presentation of Mary Academy in Methuen. Since the age of 9 she has been taking art lessons with Andover artist Janet Hamlin, who has helped her develop skills across different media. Most of her art focuses on nature or animals, but as someone who loves to travel she also paints or draws places she has visited (one of the paintings shown is a clochán, a kind of monastic stone hut, from Ireland). Her art is done in many media, including acrylics, watercolor, oil, pastels, and even paper (collages). She also likes painting and drawing in different styles, whether more realistic and detailed or more impressionistic. The most recent of these pieces are the paired still-life paintings and the roosters, which she painted to celebrate the current year of the Chinese zodiac. None of the exhibited items are for sale, but anyone interested in inquiring about her art please contact her at sketchartistla@gmail.com. I have been painting and doing art since I was very young. In 2012, I graduated with a B.A. from Emmanuel College. I find inspiration though books, for example Memoirs of a Geisha, as well as beach scenes and still lives. I grew up in Chelmsford, around nature and beaches, and while studying in Boston, enjoyed many visits to the Museum of Fine Arts. Maria Cusumano has been teaching at Endicott College since 2001, following academic appointments at St. Ambrose University and Saint Mary’s College at Notre Dame. In addition, she held positions at the Metropolitan Museum of Art, American Craft Museum, Davenport Museum of Art, Johnson County Mental Health Center, and the International Center of Photography. Her artwork is in the collection of the Brooklyn Museum, Cranbrook Academy of Art Museum, the Detroit Institute of Arts, and the Chicago Art Institute. She has participated in exhibitions at institutions including Indiana University, Pratt Institute Center, Minneapolis College of Art, and the University of Michigan. Her continued interests include writing poetry and songs, Vedanta, scholarly research, and photography. Professor Cusumano received her Master of Fine Arts degree from Cranbrook Academy of Art. Appointed Dean of the Endicott College School of Visual and Performing Arts in 2000, Mark Towner held previous academic appointments at institutions including the University of Iowa, St. Ambrose University, Saint Mary’s College at Notre Dame, Ohio University, and Wayne State University. In addition, he served in managerial positions at the Metropolitan Museum of Art, Northeast Document Conservation Center, American Craft Museum, and the Davenport Museum of Art. As a practicing artist, his works have been included in solo and group exhibitions at Rocky Neck Arts Center in Gloucester, MA, the Des Moines Art Center in Iowa, The School of the Art Institute of Chicago, and a variety of galleries in New York City. His publications include Printed Pleasure: Published Pain and The Arts in Healing. Dean Towner received his Master of Fine Arts degree from Cranbrook Academy of Art where his studies included aesthetics, photography, and printmaking. The display case features travel photographs by Memorial Hall Library staff member, Pam DiPesa. Bill Gotha has been painting all his life, but began painting professionally in 2014. He specializes in New England landscapes and seascapes; his favorite medium is oil paint. He paints en plein air and in his studio in Andover. He minored in Fine Art at Holy Cross College in Worcester and has studied painting at the Museum of Fine Arts in Boston and the George Walter Vincent Smith Art Museum in Springfield. He is a former naval officer, was art director for several publishers in the Boston area, and managed an international marketing company before launching his painting career. Bill had his first one-man show at Greenwald Gallery in Lowell in May 2016. In reviewing the show, Artscope Magazine remarked, "His work conveys the atmospheric feelings of the locations he paints, be it grass blades close by or threatening storm clouds hovering over distant mountains." In February, 2017, Bill had a two-man show with interpretive artist, Joe Flaherty, at Robert Lincoln Levy Gallery in Portsmouth, NH. Bill exhibits at Studio 8 Gallery in Newburyport, Nantucket Carving and Folk Art Gallery in Nantucket, Barrett Gallery in Portsmouth, NH, and Village Gallery in York, ME. He also participates in numerous juried and non-juried shows at regional art associations and museums, including the Missoula Art Museum in Montana, and the Whistler House Museum of Art in Lowell. In 2017, Bill's painting "Cliffs at Sand Beach" was part of an Oil Painters of America juried National Exhibit in Cincinnati, OH. He has been a juried participant in the past two National Exhibits at Cape Cod Art Association, and was recently selected for their juried All New England Exhibit, in which his painting "Forest Drumlin" won first prize for oils/acrylics. His painting "McWain Hill Birches I" was selected for the 2017 regional juried exhibit at The Guild of Boston Artists. View his work at www.williamgotha.com and contact him at bill@williamgotha.com. In youth my penchant to discover places and people began, National Geographic, my guide; for forty years with wanderlust and curiosity I covered the continents photographing cultural landscapes. I’ve come full circle—traveling the world not leaving the state. The Bay State: A Multicultural Landscape, supporting MIRA (Massachusetts Immigrant Refugee Advocacy Coalition), is a collection of informal, environmental portraits of ethnic diversity in Massachusetts. 400-plus photographs that represent over 180 countries are touring the state; a companion book for donation to schools and libraries will bring awareness to our cultural diversity: subjects of various stations, foreign-born, naturalized U.S. citizens residing in the Commonwealth. Prompted by the 2010 Census, the seed was planted earlier on assignment at Ellis Island for a 1978 essay by mentor, Charles Kuralt. Unlike my candid street photography, this is a straightforward approach: individuals looking into the camera, telling stories through expression, place and pose. Mark Chester has been a professional photographer since 1972. He was director of photography and staff photographer at the American Society of Composers, Authors and Publishers, in New York City. His photographs are in the permanent collections of the museums in Baltimore, Brooklyn, Cape Cod, Denver, Portland (Maine), San Francisco and Washington, DC, among other communities across the country. Emily O’Hara of Silver Labyrinth Design is a self-taught metalsmith and fiber artist. She maintains a metals studio at Island Street Studios at 50 Island St in Lawrence, MA and a weaving studio at home in Andover. Her interest in weaving was sparked in childhood after seeing a floor loom in the home of a family friend. At age 25, she took her first weaving class at East Lansing Community Education in East Lansing, MI. After returning east, she took classes in color theory and design and tapestry weaving at Harrisville Design in Harrisville, NH. She was a member of the Hudson-Mohawk Weavers Guild in upstate NY and Weavers Guild of Boston. Upon reading a brief article about weaving with metal in Handwoven magazine, she became increasingly curious about metal weaving and found her first course in metalsmithing at Cambridge Center for Adult Education where she has taken classes for the past fifteen years. Additionally, she has studied at Metalwerx in Waltham. There, her Fold-forming course with Charles Lewton-Brain and Micro fold-forming course with Cynthia Eid truly informed her creativity. Emily has been featured in Bliss Boston, on-line publication, in Daring Spirits blog, The Andover Townsman, collectively with Island Street Studios in The Lawrence Eagle Tribune and Rumbo. She has participated in The Weavers Guild of Boston annual show and sale, The Holly Fair in Cambridge, Crafts in the Park and various local craft shows and fairs. She had a piece in the Celebrating Women Gallery Show at Island Street Studios in May of 2017. Spending my life in New England has given me a deep appreciation of the beauty that surrounds us everyday. We are lucky enough to live in an area that has it all, from the beauty of the White Mountains and the Green Mountains, to the crashing of waves on a deserted island beach, to the peaceful solitude of the marshes and inlets, lakes and streams. My intention is to convey that pride of place and connection to nature to anyone who views my work. An ongoing challenge, which I truly enjoy. Thank you for taking the time to pause and to see. Linda Bourassa is a life-long resident of New England. Her early years were spent on the North Shore of Massachusetts, with summers on the island of Martha's Vineyard. She now lives in Atkinson, New Hampshire with her husband of 37 years. While raising their son, Linda enrolled at Northern Essex Community College and earned an Associates of Arts Degree in graphic design. She then worked at the Kimball Library in Atkinson for 15 years before recently retiring to spend time enjoying her garden, her family and friends, and devoting more time to her painting. She has been taking weekly art lessons with a local artist, Jacqueline Cunningham, for close to a dozen years. She uses water-based oil paints and tends to specialize in landscapes and seascapes. I am a New England native from Georgetown, Massachusetts, and I spent my young summers on Little Neck island in Ipswich. My warmest memories were of the natural beauty of nature and the ocean. Fully intrigued with the beauty in life, which has always captivated me, I unsurprisingly perused a career in the creative business of Cosmetology. I have enjoyed a very successful business, that seems more like fun than work and have met many very interesting people. One of these is Jackie Cunningham, a client and art teacher, who learned about my maternal grandmother’s skill as a painter and sculptor. Thankfully, Jackie encouraged me to consider joining her classes in oil painting, where I have found an unrealized gift of true creative passion. I have enjoyed each and everything I have painted and I hope to continue to get better and better in the future. Andover is not the town I grew up in, most conspicuously the area above the Center where too many newer homeowners have leveled the original residents' lovingly tended flower gardens/pollinator sanctuaries in favor of chemically treated and commercially (and loudly) maintained turf deserts. (Not to mention one long-time resident's home that was seized and demolished and their extensive gardens leveled for playing fields). In town butterfly species that used to number close to two dozen are down to 5 or 6, and those not at all numerous. Finding subjects for my lens these days requires ranging farther afield, although my own yard (a very conspicuous outlier) and that of one like-minded neighbor still offer welcome finds. Fortunately, central Andover still offers much for the nature loving photographer, (mainly thanks to Phillips Academy's benignly neglected bird sanctuary, and nearby conservation land) so I don't need to range too far afield. In fact, everything in this exhibit, except the Holt Hill image, was taken within a half-hour walk of my house. I consider myself extremely fortunate to be living where I do. In addition to my nature photography (which I offer for sale in the form of notecards and matted enlargements), I do a limited number of commissioned horse portraits in graphite, solicited mainly at Springfield Arabian shows in the spring and summer. Horses have been another lifelong passion, although I've never owned one; I've been drawing them from childhood. I have had pieces accepted twice for exhibit at the American Academy of Equine Art annual shows in Lexington, Kentucky. Avan Shah is a 7th grader at Doherty Middle School and has always had a passion for drawing since early in his childhood. He loves being outdoors whether it is spending time hiking various mountains, skiing in the trees or swimming in the ocean. His experiences from the outdoors have been the inspiration for much of his art work. This collection includes his favorite landscape drawings and sunset scenes. Avan has many other interests and hobbies, including playing soccer, skiing and squash, participating in his school math and academic bowl teams, and traveling with his family. Last year, he authored a children’s book of short stories with his grandfather titled “Walks with my Dada” for which he also provided the illustrations for each story. The proceeds from the sales of this book are donated to North South Foundation, which is a charity that provides academic scholarships to deserving, underprivileged students in India. Kristina Brainerd Trott's exhibit chronicles the Hurley's house, located at 56 Bartlet Street (see Andover Historic Preservation website, Spaulding House, for a full history) which was taken by eminent domain, and demolished, in 1970. The Town planned future Schools' use of the property. Nothing was done with the land for 11 years, and during the summers of 1973 and '74, Kristina took it upon herself to document the flourishing little ecosystem just down the street, knowing it was doomed (but not when). Garima Parakh is an Andover based artist. She was born in India and has a Bachelor's degree in Electronics Engineering. She worked in the Information Technology industry for 15 years. She has been drawing and painting since childhood. In 2012, she started painting full time. Her paintings have been accepted in several juried shows and are held in private collections all over the country. www.garimaparakh.com. My landscapes are emotional glimpses that show my deep connection with nature. I am alive when I breathe the air and feel the textures. I like to maintain a loose but exciting quality in my artwork by use of dynamic color and composition. Often times, I let my imagination and memory run free. The result is an amalgam of exciting visual images. Dominique Lecomte spent his early years in Rambervillers, a small town in Les Vosges, France. He studied visual art at Ecole de l'Images in Epinal. After receiving masters' degrees in French as a foreign language and Philosophy, he came to the United States, by way of Cambodia, to teach at the International School of Boston. He decided to specialize in linocuts and woodcuts, mainly due to lack of proper studio space. Photography, which he had always used as a visual travel log, became the base of his work. His work is held in private collections in Belgium, Brazil, Canada, Denmark, Ecuador, England, France, Italy, Japan, Norway, Sweden, and the United States. I like the little things of life, the spectacle of nature, the lines and shapes of the world. I use them to create images, to map voyages, to share impressions. It is as simple as that. Linocuts and woodcuts are original prints in limited and numbered edition, made from a previously cut wood or linoleum block. Once the block is ready, the relief is inked and a thick paper is pressed on it with a hand-pulled press or a wooden spoon. Colors, when present, are watercolors applied later with a brush (details and history of the technique at www.lecomtedominique.com). 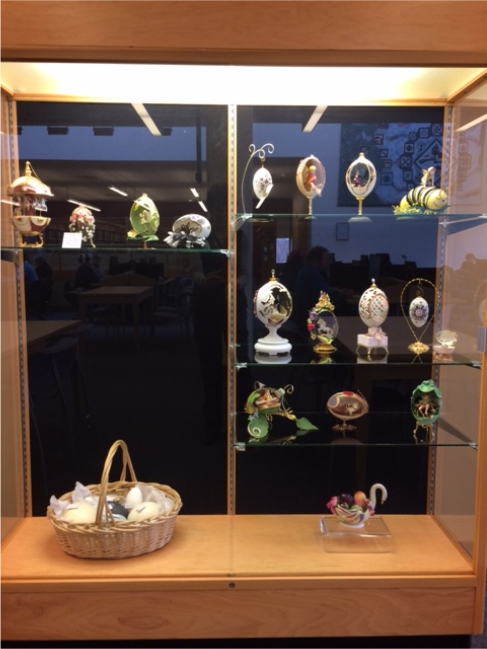 Although egg art includes many forms, from Ukrainian, a dye resist art, to beautifully carved eggs, cutting away the outer shell to expose the membrane, Connie's passion is Faberge-inspired egg designs. She's been egging for over thirty years. She travels to PA, OH, and WA, preparing “egg kits” and teaching the design. In America, there is a guild for just about every hobby. She's now become the President of the New England Egg Art Guild (NEEAG). Their members are from both MA and NH. Their Guild is part of the International Egg Art Guild, with members throughout Europe, Japan, China, Australia, and New Zealand. Seven years ago, Connie started holding classes in her basement in Andover. She named her business, Taylor’d Eggs, which is a perfect moniker as her name is Constance (Connie) Taylor. Eggers purchase their infertile eggs blown out and cleaned. She purchases her eggs from farms in South Carolina and Indiana. She uses ostrich, rhea, emu, quail, and goose eggs. She uses both a Dremel for heavy cutting and an air-powered tool for fine work. The air-powered tool rotates so rapidly, it allows the designer to create fancy cut work without breaking the egg. Remember, eggs aren't just for breakfast anymore. "You won't find just families, babies, bellies, pets and corporate headshots in my portfolio. You'll also find the elusive Fae people. I don't just push the button on the camera; I am inspired to create the scenes that come to life when your child walks into my studio. Every detail is meticulously thought out and it takes months to curate all the pieces that bring the scene to life." Pearl has been part of the photography and art worlds since childhood. Her artwork can be found in private and public collections around the world. The heirloom images she creates for families, at her studio in Andover, will be treasured for generations. My works on display reflect my artistic journey through many media. I started in black and white, using pencil, pen, charcoal and scratchboard. Introducing color with colored pencils and chalk pastel into my work was my next step. Eventually I started to experiment with collaging and creating works from mixed media. Although not represented in this exhibit, I also enjoy creating pieces from found and recycled materials. Having grown up at the foot of the Mount Holyoke Range, I developed an early love of nature, and my convocation as an environmentalist. I often try to bring attention to endangered species or landscapes through my art. The subject of my works is almost always depicting some aspect of nature. Suzanne Robert recently retired as a hydrogeologist from the Massachusetts Department of Environmental Protection (DEP). Having trained as a scientist, she started taking art lessons through adult education classes after completing her formal education. She has also taken continuing education classes at the Mass College of Art and the Essex Art Center to explore different media, refine techniques and develop her own personal style. She has had her art exhibited at several DEP exhibitions, a juried Mass College of Art show, and received a First Place in 2006 for a mixed media piece from an AIGMV show. Suzanne is an avid organic gardener. Having received a Certificate in Invasive Plant Management, she volunteers with the Andover Conservation Commission for invasive plant removal and issues involving the Shawsheen River. In addition to creating art, she enjoys expressing her creative side through singing and dancing. Memorial Hall Library staff member, Sarah Nourse, has worked at the library since 2008, first in the Teen Room and now in the Children's Room. She started painting at a young age with simple finger paints, but eventually took her first art class at the Musuem of Fine Arts in Boston. Art has always been a special part of her life, and she enjoyed all of her art classes through middle school, high school, and college. She likes painting with watercolors because she finds them very easy to use. Fairy tales, folk tales and myths have always fascinated me. I believe they speak to our Jungian collective unconscious. I have always particularly adored animal tales, which bring out human foibles in anthropomorphized format. In my watercolors, I seek to illustrate those animal tales in as realistic a way as possible, as if it really were possible to keep boots on a cat, or for a grasshopper and an ant to converse. I actually do quite a bit of research to choose as authentic an environment as possible, whether it is what our collective unconscious believes a troll should look like, or what sort of spider would live in Jamaica, which is the American source of many of the Anansi tales. To produce each painting, I start with a detailed pencil drawing based on photographs. I then ink it using technical pens of varying thicknesses. After the ink has set, I erase the pencil and paint it, then I write the accompanying story, based on as many sources as possible. Some, like Aesop's fables, are merely a paragraph or two; others can be quite long. I write more for adults than children, because I believe we all can still learn from these tales. Lisa Hertel is an artist from a long line of artists. Lisa's art is mixed, both 2D and 3D, in a variety of media. She is willing to learn and try anything new. A potter since the age of seven, she makes a variety of ceramics, including wheel work and sculptural items. She loves to draw, and does both pencil work and intensely detailed pen-and inks; she also paints, mostly in watercolors, and does wire sculpture. She often combines media, such as adding watercolors to the pen-and inks, or using glass in her pottery. Recently, she has begun doing encaustics. She has also learned blacksmithing, glass blowing, paper-making, stained glass, and glass fusing. She offers classes in her studio at Western Avenue Studios in Lowell, which is the largest art colony on the East Coast. After 25 years as a pharmacist, she quit her day job to pursue a career in art. Her other passions include speculative fiction and volunteering; she helps run literary science fiction conventions and curates an exhibition of art at the Essex County Probate Court. She has been an Andover resident for 25 years. Visit her website. Vicki Murphy's love of working with wool was a graduated process. It began with knitting, felting and rug hooking but her preference these days, and where she gets most creative, is with wool applique. After years of pursuing her hobby, she has a huge stash of wool and yarn and finds that working with wool is the best kind of therapy, especially during long cold winter months in New England. Clare Curran is a librarian at Memorial Hall Library and has been collecting PEANUTS memorab ilia since the early 1970s. After receiving an MBA from Harvard University and having a rewarding career in health care management, in 1999, Howard Hoople began renewing his childhood interest in butterflies. Howard is now an accomplished butterfly photographer and President of the Massachusetts Butterfly Club. 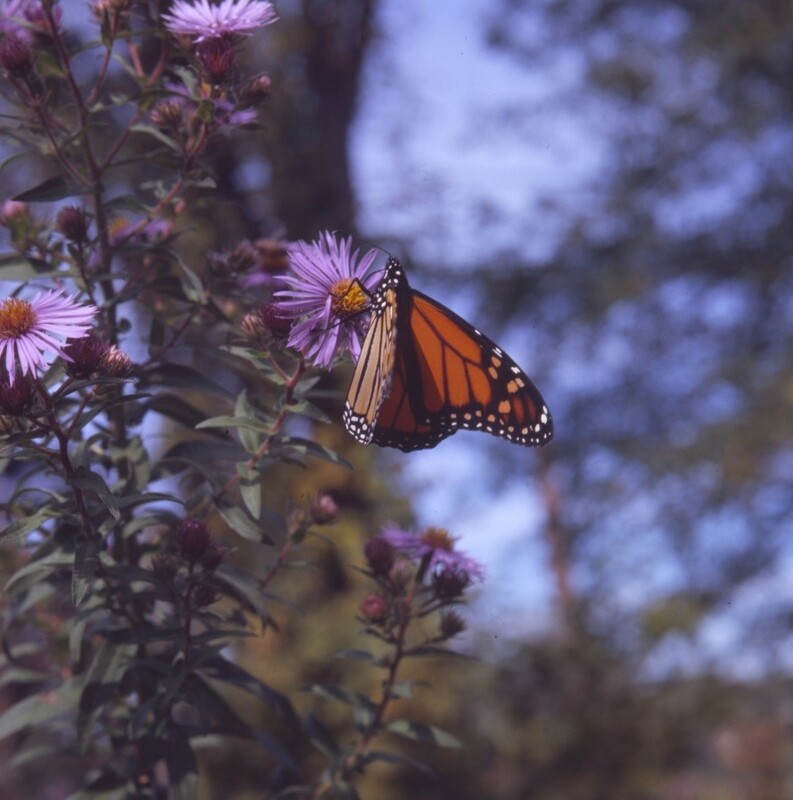 He has had butterfly photos published in Merrimack Valley, Massachusetts Butterflies, American Butterflies, and Butterfly Gardener magazines. He also produces an annual butterfly calendar and note cards featuring his photos, and is very pleased to talk with anyone interested in learning about butterflies. The Inca road system was the most extensive and advanced transportation system in pre-Columbian South America. The best known portion is the Inca Trail to Machu Picchu. We journeyed through varied terrain both challenging, awe-inspiring and literally breathtaking as we climbed altitudes exceeding 15,000 feet. As we descended down the trail, the sights only became more enhanced by spectacular topography, lush vegetation, and intriguing archaeological areas. Infrared, or 'IR' photography, offers photographers a method to explore a new world because our eyes literally cannot see IR light, as it lies just beyond what is classified as the 'visible' spectrum - that which human eyesight can detect. When we take photographs using infrared-equipped cameras, we are exposed to the world that can often look very different from that we are accustomed to seeing. Colors, textures, leaves and plants, human skin, and all other manner of objects can reflect IR light in unique and interesting ways. My camera was converted to record 'near infrared' light just beyond the range that humans can detect with their eyesight. This light range is between 700 - 1200 nanometers. Reflected IR light produces a fascinating array of surreal effects. Vegetation appears white or near white as they reflect IR. Water and sky take on a much more dramatic dark appearance as they absorb IR. Since just one wave length of light is recorded, most images will appear sharper than full spectrum images. All of my infrared images were converted monochrome B&W. Skip Montello is a photographer working and living in Rockport Massachusetts. He is an exhibiting member of the Rocky Neck Art Colony, Rocky Neck Gallery, Rockport Art Association, Newburyport Art Association and the Griffin Museum of Photography. His passion for photography developed during his career at the Polaroid Corporation, where he spent more than 30 years as a photographic scientist, engineer and technology leader. Over the years he has moved from film based media to digital. He has a deep love for the area in which he lives and is constantly inspired by the ocean. When not photographing, he is a sport fishing charter captain, sailing instructor and outdoor writer. He also arranges the programs for Fish On! Andover, which is going into its 18th year. Skip's photography is frequently displayed in many juried exhibits around the country. His photography has earned numerous awards at the art associations in Rockport and Newburyport and the worldwide Nikon Small Wonders Competition. He has exhibited in several solo exhibits including art associations and public libraries. His work is held in private collections in the USA and Europe. Skip is a graduate of Northeastern University, Engineering and Science and a US Navy Submarine Veteran. During my professional career, I have been a corporate writer, photographer, graphic designer, motion picture editor, outdoor writer, author, fishing columnist, and communications director, often concurrently. Many of the digital drawings in this exhibit are inspired by my photographs, but they contain no photographic elements and are drawn line by line from scratch, using the computer's mouse as a pen and brush. Once printed, I further enhance each archival pigment print with pastels so that each becomes a unique, mixed-media original. I create these digital drawings using Adobe Illustrator. They are vector graphics, which are based on mathematical equations and can be resized to any dimension without pixilating. My digital drawings have a highly graphical quality, which becomes transformed, in varying degrees, by the application of additional details and textures in chalk pastels. The result is a colorfully saturated melding of graphic design and fine art, a changing edge where precision and impression interface. Visit www.cliffhauptman.com. My necklace designs are inspired by my travels in the Southwest and reflect the desert colors and Native American cultures. While hiking in the high desert, I collect many of the stones I use in my work. One of my favorite places to collect the luminous agates is the area around Abiquiu where Georgia O'Keeffe lived and worked. After polishing and drilling holes, I incorporate these beautiful stones into my work. I also include fossils and petrified wood in some of my pieces. I purchase other stones from Native Americans selling their beads at roadside stands and in small shops in New Mexico. I combine my passion for crochet into my longer necklaces by crocheting with silk thread and waxed cotton. 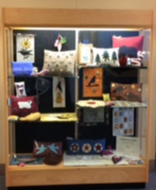 Some of my crochet shawls, market bags, a shell box, and purses are also on display. Michael Lenihan took up oil painting as a pastime at the age of 48 and has been painting landscapes steadily since he began studying in the Newburyport studio of Robert Scott Jackson, a Copley master painter. Michael is a native of Nova Scotia and moved with his family as a child to the village of Garden City, a suburb of New York City on Long Island. He lived and worked in the New York area until moving his own family to North Andover in the mid 1990’s. Michael and his wife Barbara have three grown children and three grandchildren. In addition to numerous private collections, his paintings are held in several corporate collections throughout the northeast United States. Michael frequently donates his paintings to favorite causes of his family including North Andover’s Hermann Youth Center, the Essex Art Center in Lawrence, Swim Across America/Dana Farber Cancer Institute, the Brain Tumor Foundation at Newton Wellesley Hospital, Andover Chamber Music, the North Shore Artist League, and the New England Shelter for Homeless Veterans, among others. He has found that painting has provided him with an enhanced awareness and appreciation of the ever changing physical world around us all and which he admits he took for granted prior to his putting brush to canvas. Laura Minning began writing creatively at the age of nine. She’s become an award winning published poet and author since that time. All in all, she’s written one-hundred and seven individual poems, six articles, two books and one short one-act play, published in both hard copy and online. Her work has been featured in the publications, Literature Today, Amulet Magazine and Slate & Style. Laura received her first Editor’s Choice Award in 1993 for “bronx zoo” and her first international poetry award in 1995 for “introspection” by the National Library of Poetry. Poetry.com recognized her work a decade later by granting her the title of International Poet of the Year. Laura’s artistic accomplishments are equally impressive. She’s had eighty-two original pieces exhibited and eleven published. Her work has been displayed in venues like the VMFA Studio School, Haverhill Public Library and Barcode. The Barcode exhibit, sponsored by Bacardi, featured thirty-six pieces of Laura’s artwork during the month of February in 2016. Additional information about Laura and her work can be found at http://bluerosecreations.wix.com/bluerose. As a person with low vision and blindness, Laura hopes to inspire other creative people to never allow anything to hinder them from reaching for the stars and accomplishing their dreams If you were to ask her about her creative successes, she would tell you that the difficult is but the work of the moment, and the impossible takes a little longer. Heather Barker comes from a creative family, many of them pursuing careers in the arts. Heather has worked in human services for over 25 years, including working at a women's shelter answering domestic abuse hotline calls and performing case management. She has also worked with teens at the Department of Youth Services and with adults of various abilities and barriers, finding vocational training through the Mass Rehab Commission. Heather broke state records in Massachusetts with the number of people she assisted in regaining employment. She also worked in the Welfare to Work grant program through the Department of Transitional Assistance. Raising her daughter as a single mother has made her realize that she needs something for herself, some form of creative expression. “After hearing so much of the darkness and struggles in the world through my human service jobs over the last 25 years, I began to snap away. I found photography more valuable than ever to help me focus and to remember the beauty in the world all around me everywhere, people, family, nature, my daughter, events…whatever, I began to snap away." Brand Ambassador for Howl Magazine, www.howlmag.com, a local print and online arts and entertainment magazine. My photos are used in the magazine and online. She plans on doing more shows in the future. You can follow her photography journey on her Facebook page, Heather Barker’s Photography. The process of Raku includes placing glazed pieces of pottery in a kiln, usually powered by gas burners. The glazes respond to the low-fire temperature, which rarely exceeds 2000 degrees F., by melting, bubbling and developing a “shiny look.” When the glazes are mature, the pot is removed with tongs and placed in a container filled with combustibles such as shredded paper, magazines, straw or sawdust. In this reducing environment, the combustibles ignite, creating a smoke-filled atmosphere. Those areas of the pot left unglazed become black as a result. In addition, metallic luster, crackle patterns and iridescence are possible in this exciting process. Raku, as a firing method, provides an opportunity for serendipity and immediacy, which enhances its appeal for me. Historically, Raku bowls were thought to have been made first by a Korean immigrant to Japan. His son, Chagiro, (1515-1592) and his family became known as the Japanese “Raku family.” Chagiro made tea bowls for the famous tea master Sen-no-Rikyu. This genetic line of potters continued until 1944. Raku tea bowls exemplify the Zen emphasis on “simple living,” and were originally associated with the Japanese tea ceremony. Classical Japanese tea bowls are small, irregular, made by hand and without detail. Their simple form, unadorned rim, lack of detail and understated glazes require handling in order to be fully appreciated. Raku in America is very different from its Asian ancestor. Here, Raku is known for flamboyant color, metallic luster and free form. Emphasis is placed on the exciting process of firing with glazes that can amaze our senses and challenge our notion of what pottery can be. Francois Gossieaux has captured life through a lens for most of his adult life but he has only recently started sharing his images and perfecting his craft. In 2011, Francois went through a difficult personal journey and his escape became his camera. He picked one weekend day during his journey to travel throughout New England observing, discovering and capturing the beauty in everyday life. Francois has emerged into a passionate photographer who strongly believes that if we pay attention to what happens around us, we can all become observers and visual storytellers about our environment—the diverse (and sometimes disappearing) cultures that we interact with, the injustices that we witness every day, the beauty that surrounds us, and the daily awe-inspiring experiences that we get when (and if) we open our eyes and pay attention. Francois uses a Canon 5D Mark III and a Canon 7D with various Canon lenses. His work can be seen at humanobservations.com & @fgossieaux. The Andover Reads 2016 book, The Boys in the Boat is a story of an epic Olympic journey. This team, of working class boys from foggy coastal villages, dairy farms and smoky lumber towns, reminds you of what can be done through determination, transformation and hope. Although the boat is not the star of this story, the bond between the boys and boat can only be imagined as they row their way to fulfilling their Olympic dream. Francois Gossieaux captures the escape, inspiration and sometimes defeat in his series Boats: Dreams Made and Broken. My passion for art began at an early age during visits to a neighborhood artist in Newport, Rhode Island. This led to training as an illustrator in the US Air Force and continued as a graphic artist in the Boston area. After studying with renowned pastelist and teacher, Albert Handell at drawing and pastel workshops in Woodstock, New York, the focus of my work was portraits of children and animals. I continued in this genre for many years. While a student of the late David Ratner and John Evans, both renowned artists, my passion turned to oil painting. This medium allows me to build paintings with texture, using palette knives, brayers and various size brushes. My fascination with the ocean continues to inspire my work. I enjoy searching the New England and Eastern Shore coastlines to find subjects that display a mood that will transform into a painting. Looking into a tidal pool or the reflection of a small boat on the water gives me an emotional feeling of calm. The colors produced by the boat, sky, or water and sand enrich the scene. Shadows on the sand or reflections and shadows on the water are ever changing, and finding these painting opportunities is exciting and priceless for me. Visit www.robfranco.com for more information. What separates reality from memory – emotion, vision, desire, prayers? What moves us beyond a place of certainty to a place where dreams are held? Drawing on an exploration of memory, these images are reflections from my past using places, events and people that have continuing resonance for me. I consider my relationship with family, friends and animals as a starting point to create work in a narrative style that is also influenced by a strong interest in history and material culture. I have studied with Israeli artist, Eli Shamir, and continued my art education with courses at the Museum of Fine Arts/Boston, the DeCordova Museum School, The Haystack Mountain School and the Essex Art Center. I hold a BA/history from the University of Colorado and MA/bilingual-ESL studies from UMASS/Boston. My paintings have been shown in Massachusetts in the Merrimack Valley, Boston and Newton, and in Deer Isle, Maine. Actively working for my community, I serve as Chair of the Andover Preservation Commission, President of the Memorial Hall Library Board of Trustees, and as a board member of the Essex Art Center and the Lawrence History Center in Lawrence, MA. For eleven years I organized the artists participating in “Hair of the Dog “, a wine and art event to benefit the MSPCA Nevins Farm in Methuen, MA, held at the Essex Art Center. Four years ago I became the event coordinator for Crafts in the Park Andover, a high end juried crafts show, now in its 41st year. The event benefits the mission of Christ Church, Andover. I happily share studio space at OH Studios, located on Island Street in Lawrence, with three other artists. I am very pleased to have been asked to show my work at Memorial Hall Library. Matt is currently an Andover resident who grew up a few towns to the north in West Newbury. He graduated from the University of New Hampshire in 2013 with a degree in Environmental Engineering and is working within the field in Chelmsford, MA. Painting is mostly a hobby which he has been lucky enough to pursue thanks to the many hours spent in hotel rooms when travelling for work. When not travelling to job sites in New England, he likes to vacation abroad and is inspired by the unique countries and their trademark landmarks to create many of the art deco travel posters on display here. Inspiration for the oil-based animal paintings comes from enthusiastic friends and family and their all too willing subjects. If you have any questions or like what you see he can be reached at matthewrp91@gmail.com. Works in clay created by adult classes at the Essex Art Center are on display. The exhibitors include students in Clay Works with Larry Elardo: Gale Batsimm, Christianne Tardif-Kellerd, and Amy Ferguson, and students in Hand-building with Peter Wood: Virginia Dalis, and Kristen Donegan. Gayle Heney, who has taken classes at EAC, also has two pieces on display. A ten year absence from pursuing any serious photography has freed my thinking, and along with the digital revolution, given me new insight and inspiration. Renewed with fresh ideas and a new vision, I have moved from the literal (true to life) renderings of my early work, to creating images that are more expressive of the scenes in nature that inspire me. The prints in this exhibit are an exploration of the shapes, colors, and textures found in the national forests and national parks of New England. All have been printed with archival pigment inks on archival papers. Kevin Porter has pursued photography as both a hobby and professionally since the late 1970s. He has worked extensively with small, medium and large format film cameras, digital SLRs, film and print processing (both B&W and color), alternative techniques such as Polaroid transfers, macro-photography, the Zone System, digital image editing with third party effects and filters, commercial photography, and studio photography. Currently, Kevin divides his time between his freelance design and communications business, and his fine-art photography. Over his career he has worked in academia, the non-profit sector, the photo industry, conducted research in the life sciences, and founded creative service businesses. Active in the community, he volunteers time to local conservation issues and serves on the Andover Conservation Commission. Kevin can be reached at: kevin@kporterdesign.com. 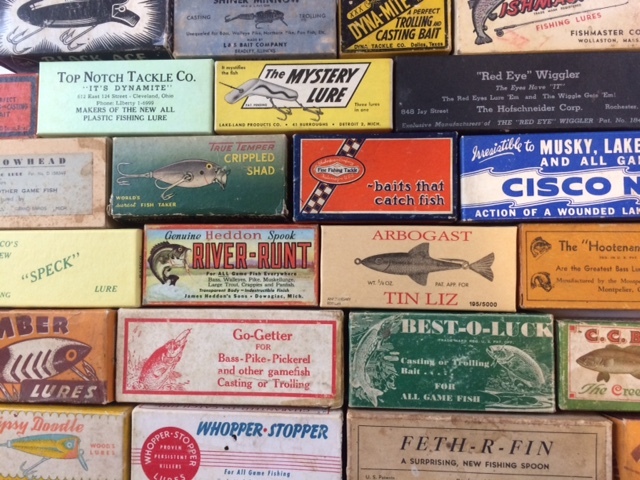 A display in the new case in the Reference Area features examples of vintage fishing lures, including lures from the early days of fishing lure manufacturing in America. In addition, lures from the five major lure manufacturers are on display, as well as vintage lures manufactured in Massachusetts. The display also highlights saltwater plugs made by craftsman Mike Shah of Workhorse Lures, the featured speaker on Tuesday, February 9 in the Fish On! Andover series. Randy Tustison was born and raised in Garrett, Indiana - the home of Creek Chub Bait Company (CCBC). CCBC was one of the five largest manufacturers of fishing lures in America from 1916 until it was sold in 1978. He acquired a love of fishing from his Grandfather, fishing many of the small lakes in northeastern Indiana as well as Pipestone Lake in Ontario, Canada. 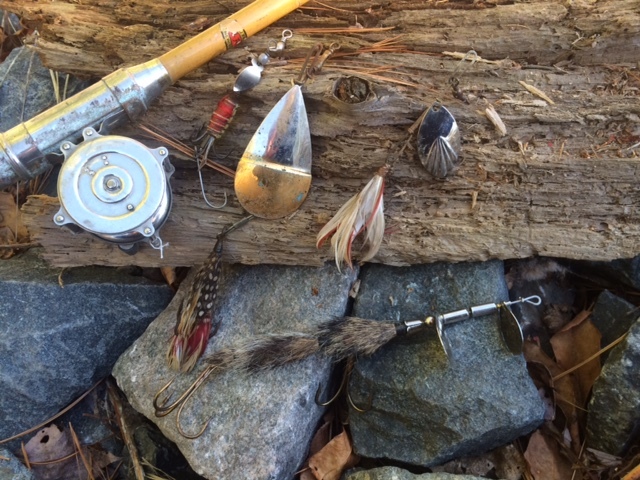 Randy became interested in collecting fishing lures while delving into his family history, learning that his Grandfather manufactured and sold fly rod lures for a short time in the 1930’s. He is a member of the National Fishing Lure Collectors Club (NFLCC) and has written for the NFLCC Gazette. He is currently retired and lives in Andover with his wife, Kay. Stephanie Mobbs Deady is an artist with a zest for life and all things whimsical. Family, laughter and love fuel her and inspire her creative process. Stephanie paints at her home studio in Andover and is available for commissioned works. Visit www.stephaniemobbsdeady.com. I began hooking rugs about four years ago from a suggestion from co-worker Vicki Murphy. I resisted for a while, but finally gave in and love every minute of it! I like to collect projects from places I have visited. Currently I have two-- the sheep hanging is from Texas, and I have a rug from California of California Poppies that is still in the works. I have been sewing since I was big enough to push the foot pedal of my mother’s sewing machine, and enjoy quilting and other home decorating projects. I also enjoy wool appliqué and have been doing more of this recently. I’ve been a librarian at Memorial Hall Library since 2004. I’ve always been interested in art and began rug hooking in 2009. I like the challenge of designing my own rugs. I’m working on my largest one yet at approximately 7 X 4 feet. The hobby is even more enjoyable because I share the interest with my co-workers, Vicki and Gerry. I have been rug hooking for about 4 or 5 years now. I transitioned into it after lots of knitting, quilting, beading, and hand appliqué. I cut most of my strips by hand as I don't own a cutter (yet...) and enjoy the evolution of color as I try out plaids, tweeds, hand-dyed wool, etc. for effect. I'm drawn to sheep and crows and all things primitive. I hope to begin designing my own patterns now that I have the technique down. It's a lot of fun sharing this hobby with my co-workers, Kim and Gerry, and comparing pieces we've made, and giving each other advice and suggestions. The craft is especially enjoyable on long, cold, winter nights and days, when a lap full of heavy wool is cozy. I would love to share ideas with interested people in town and welcome their questions about rug hooking any time. Debalina Sarkar is a new artist and a resident of North Reading. As a small girl, she was interested in art, but soon discontinued it for academics. Her parents were called to school in second grade because her teacher thought that her parents had helped her with her art homework. Her teacher made her paint in front of her because she couldn't believe a second grade girl could paint that well. Since then, Debalina has painted many paintings during festivals in India. Although she is a research scientist by profession, she rediscovered her art after almost 25 years, after her son was born. She started painting early this year, and was so excited that she painted over 100 paintings in 5 months, mostly with her newborn in her arms. She paints mostly landscapes, flowers and small animals. She uses traditional oil painting on canvas, but has also worked with acrylics and watercolors. Her influences include American, European and Indian painters. She has also been inspired by various art forms such as contemporary, wet-on-wet, Madhubani, and Renaissance techniques. A lot of her ideas come from within, but many are influenced by modern day painters such as Bob Ross, Wilson Bickford, Ginger Cook, Kevin Hill, and Gary Jenkins. Andover High School students in Mary Robb's 20th Century History class worked in teams and researched a decade in Andover's history from 1900-2000. They collected photographs and information and created posters to reflect what the community looked like by decade. Of Many Colors, created by the Family Diversity Projects, includes photographs and interviews with 20 families (children, teens, and adults) who have bridged the racial divide through interracial relationships and/or adoption. In a world where race is considered by many to be a formidable barrier between people, the families in this traveling exhibit have discovered richness and value in diversity. This exhibit of multiracial families has a great deal to teach about racial identity and racism. The same exhibit will be displayed in all five Andover elementary schools during September. Of Many Colors is also available in a beautiful companion book (featuring over 40 families) published by the University of Massachusetts Press. Major funding is provided by the Andover Coalition for Education (ACE) and elementary school PTO's. Andover Coalition for Education (ACE) partners with the Andover Public Schools to support innovative system-wide, curricula-enhancing initiatives that will inspire our students to succeed in facing today's global challenges. Since 2005, ACE has granted more than $500,000 to support public education in Andover and is continuing its work to broaden support and community involvement in our schools. To learn more about ACE, visit www.aceandover.org or contact Jennifer Srivastava at jsrivastava@aceandover.org. Shahrzad Shadbash started painting when she was four years old, and studied with some of the most famous master painters in Iran. She studied Traditional Architecture and Architectural Technology Engineering at Azad Tehran University, and began painting with oils professionally in 2000. She began sketching and working with ink in 2009, and has held several private and public exhibitions to showcase these works. She has worked within Cubism, Impressionism and Surrealism, and has also tried a one-stroke technique in some of her work. Most of her work falls within the realm of Realism and a combination of Realism and Impressionistic techniques. Prismatic and electric, painter Donna Howard cleverly weaves subtle narrative into each one of her bright paintings. Textured and nuanced with an ambient, lyrical sense of space, Howard’s paintings are emblems of a prolifically curious mind, and speak to diverse experiences and moments of human life. Strict, precise brushwork betrays the artist’s ardently playful and whimsical fancies, speaking to the duality inherent in all of our psyches. With every shift and movement of the eye as it engages with Howard’s works, we see refreshingly differently, as if we were looking through a kaleidoscope. An emerging artist, Donna Howard has already exhibited her works throughout the Northeast. Joseph Gemellaro is a natural-born talent greatly influenced by the drawing styles of the great Italian masters, Leonardo da Vinci and Michelangelo, after having travelled to Italy as a young boy. He brings this appreciation of European art into the sketches he creates of 20th Century American pop icons, from Charlie Chaplin, Louis Armstrong, Elizabeth Taylor, and Janis Joplin to Superman, Steve Jobs, and Barack Obama. "I start with the eyes," Mr. Gemallaro says when describing his method for drawing portraits. And it's the eyes that immediately attract the viewer, drawing them in to the heart and soul of a familiar face. Nowhere is this more evident than in his portrait of Mohammed Ali. Although this portrait features only Ali's eye and eyebrow, viewers instantly recognize it as the portrait of the flamboyant boxer who floats like a butterfly and stings like a bee. Similar to Ali's gift for showmanship, Mr. Gemellaro sketches with unabashed force, apologizing to no one as he lays it all on the line. The Level 2 display cases feature a special display of artifacts which offer a fascinating glimpse into the life of an American soldier during WWI. Andover resident, Susan Schön has worked as a textile designer for over twenty-five years, designing products ranging from original one-of-a-kind hand-painted silk clothing, her own line of hand-painted children's clothing, wall coverings, upholstery, apparel, and numerous graphic design applications. Her work as a designer has allowed her to develop many different styles, and her passion for art and design continues to grow, often inspired by observing and exploring the natural world. The Level 2 display cases feature a photo exhibit commemorating the 100th anniversary of the Armenian Genocide, on display until May 10. The collection by photographer, Tom Vartabedian, is entitled “Armenian Village People --- A Country Kaleidoscope” and depicts life in modern-day Armenia, a century following a devastating massacre by the Ottoman Turkish Government that killed 1.5 million people and left another million displaced from their homeland. A showing of color images represent part of a collection taken by Vartabedian during two trips to Armenia over the past decade, covering scenes of people living and toiling in the mountains and valleys. The images depict life in this historic land whose history dates back more than 3,000 years. The Andover library is among others throughout Merrimack Valley and the North Shore which will feature the exhibit during this centennial year. Vartabedian, a Haverhill Gazette columnist, worked as a photographer for 40 years before retiring a decade ago. Much of his photography these days is dedicated to travel and pleasure. Trees are living, breathing entities very much like people: born from seeds, growing through infant and teen years into large, mature beings. They have personalities of their own with distinctive shapes, sizes, spring-colored buds and unique shaped leaves which change color in the fall. They drop when the snows come, only to start the same cycle over again in several short months when the ground thaws. Trees and forests are some of the touchstones of our lives, as we return to them year after year to see how they've changed and grown and perhaps to think about how we've also changed and grown. These images in The Beauty of Trees exhibit capture the unique beauty of different trees, in different parts of the country, in different times of the year. Full of gold aspen leaves in Colorado, red and orange maples in New England, in black and white in the high desert country, in snow storms in our own Harold Parker State Park, some sharp, some diffused, they bring us joy and pleasure and ease our mind. Ron Wybranowski is a member of the Massachusetts Camera Naturalists, a by-invitation-only organization dedicated to the appreciation of nature and the natural environment. He is a juried member of the New Hampshire Art Association and a long-standing member of the Merrimack Valley Camera Club (MVCC) in North Andover. He resides in North Andover. For more information and to view his photographs, visit his website www.ronwybranowski.com. Skip is a photographer working and living in Rockport Massachusetts. He is an exhibiting member of the Rocky Neck Art Colony, Rocky Neck Gallery, Rockport Art Association, Newburyport Art Association and the Griffin Museum of Photography. His passion for photography developed during his career at the Polaroid Corporation, where he spent more than 30 years as a photographic scientist, engineer and technology leader. Over the years he has moved from film based media to digital. He has a deep love for the area in which he lives and is constantly inspired by the ocean. When not photographing, he is a sport fishing charter captain, sailing instructor and outdoor writer. Skip's photography is frequently displayed in many juried photography exhibits around the country. His photography has earned numerous awards at the art associations in Rockport and Newburyport and the worldwide Nikon Small Wonders Competition. He has exhibited in several solo exhibits including art associations and public libraries. His work is held in private collections in the USA and Europe. 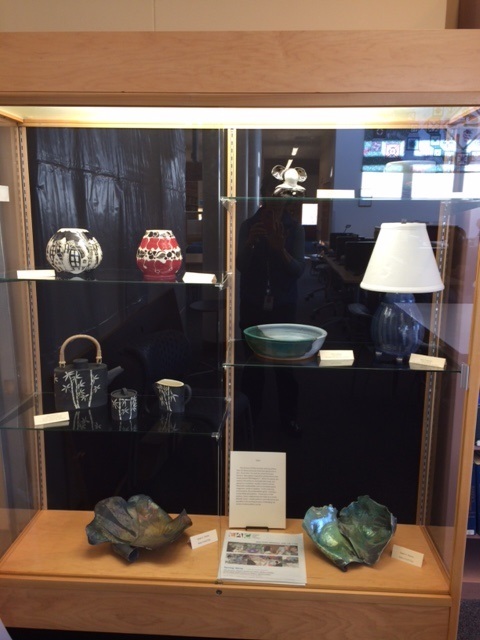 The first floor exhibit features pieces created by two Andover residents, Ruth T. Naylor and Cornelia van den Broeke. The Level 2 display cases feature photographs of past Academy Award winning actors and actresses. Ruth Tiffany Naylor studied at The Slade Summer School in London, England in 1992 and 1998, locally at The Museum of Fine Arts, the DeCordova Museum School and the Cambridge Center, and at Montgomery College in Maryland, where she earned an Honours Associates in Studio Arts degree in 1993. Currently, Ruth is working with the Board of Trustees of West Parish Garden Cemetery, Andover MA to put on a juried 2-D and 3-D exhibition to show at the Andover Historical Society and the cemetery grounds in October 2015. Local colleges, high schools and artists are participating in this project which is partially funded by the Massachusetts Cultural Council. Cornelia van den Broeke moved to Andover in 1978. After completing high school she moved to Boston and studied at The School of the Museum of Fine Arts, graduating in 1990. She lived in New York City for 4 years, returning to Andover in 2000. She is most inspired by Dadaist artists such as Marcel Duchamp and Francis Picabia, as well as contemporary artists Julian Schnabel and Anselm Kiefer. She has worked in various media over the years, and has exhibited in cafes and in group shows in Boston and NYC. Andover resident, Sanjeev Nandan is a self-taught artist driven purely by the passion to create something new and interesting every time he has a blank canvas in front of him. Every painting is an experiment and a learning experience. Over the years, he has been influenced by various artists and their styles. His creations are original concepts designed by infusing real life subjects with a bit of imagination. His style has evolved over time, but one thing has not changed - the paintings are bright and colorful. He uses acrylic paints to give them an almost oil-like effect. To see more of his artwork go to http://fineartamerica.com/profiles/sanjeev-nandan.html. The Level 2 display cases contain photographs taken by students at Andover High School's Photography Club as part of their Humans of Andover Project. Inspired by the Humans of New York project, the students set out to capture various personalities within Andover. The artwork shown is a combination of film and digital photography and showcases what stood out to these photographers around our town. The Level 1 hanging exhibit features artist Diane Maroun. Andover artist, Susan Siegel has been painting with pastels and acrylics for almost 20 years. The paintings in her exhibit, Landscapes I Have Known and Loved," focus primarily on color, light, mood, and atmosphere, and are based on her emotional responses to the landscapes of her travels and to her connection with the ocean in Cape Cod. Along with her husband, Susan is both an artist and seasonal gallery owner of the Front Porch Gallery in Wellfleet, MA. She is also a member of several local arts organizations, including the Andover Artists Guild, the Newburyport Art Association, the Wellfleet Art Galleries Association, and the Pastel Painters of Cape Cod. Her work has been exhibited primarily in New England and sold throughout the U.S. to collectors from New Hampshire to California. Rob Franco's passion for art began at an early age during visits to a neighborhood artist in Newport, Rhode Island. He trained as an illustrator in the US Air Force, and worked as a graphic artist in the Boston area. A fascination with the ocean and other bodies of water continues to inspire his work. Visit his website at www.robfranco.com. Steven Noroian, a fine art photographer from North Andover, combines the latest digital techniques with traditional photography to create bold and evocative prints. With an eye towards abstraction, he works to capture the beauty of his surroundings through strong composition and brilliant color. His work reveals his passion for landscapes, architecture, and still life photography  capturing the essential elements of New England and Europe. Steven has been an Artist at the Brush Art Gallery in Lowell for ten years. At the Brush, he has a studio to display his work, and he participates in an annual collective show. Visit the Brush Art Gallery in Lowell or visit his flickr website.